This is a guest blog post by Nancy Settle-Murphy, author of Leading Effective Virtual Teams and renowned expert in planning and running engaging virtual meetings. Are these five things true of your virtual meetings? Participants are prepared to present and discuss all topics. Everyone presents within their time allotment. People are actively engaged throughout. Progress is noted, ideas shared, questions posed, problems resolved, outstanding actions are summarized, and new roles are assigned for the next meeting. And meetings never run late. If you didn’t answer “yes” to everything in the list, that’s okay. I find most organizations are in the same boat. That is until I met Rick Friedrich. Rick, the Director of Sales in the Americas and General Manager North America for Jiffy Products called me in to “fix” his virtual meetings. At first I feared the worst. Every month Rick coordinates a meeting through phone and WebEx with about 35 participants from the U.S., Canada, and Latin America. As you can imagine, there are many cultural and language barriers across this group of people. But as I sat through two of his meetings (admittedly, they were already pretty good), I realized he was on the brink of something great. Rick was developing a step-by-step process to increase productivity during his virtual meetings — something I hadn’t seen from any of the organizations I’ve worked with. Together we tried and tested the process until we perfected a six-step formula that checks off everything from the list above. Ever since, Rick has enjoyed super productive virtual meetings. 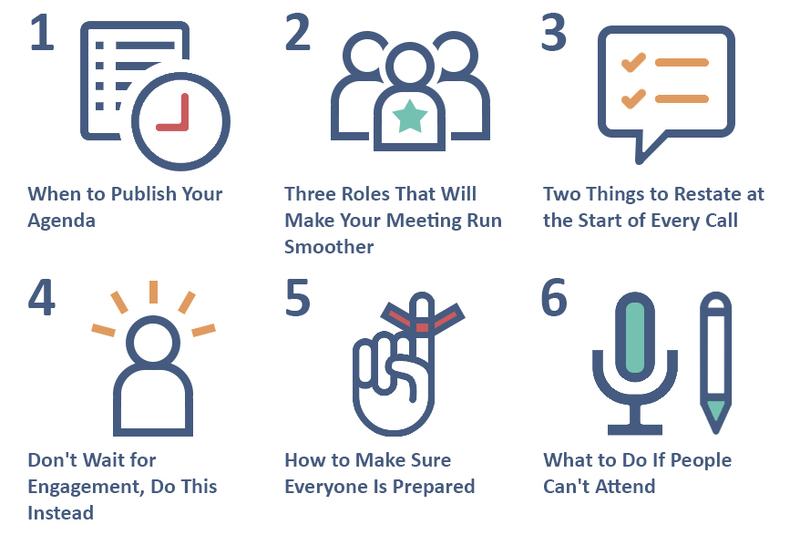 If you’d like help making your virtual meetings more productive, I’d like to share that same six-step formula along with the exact templates Rick uses for his meetings (all templates are at the end of this article). 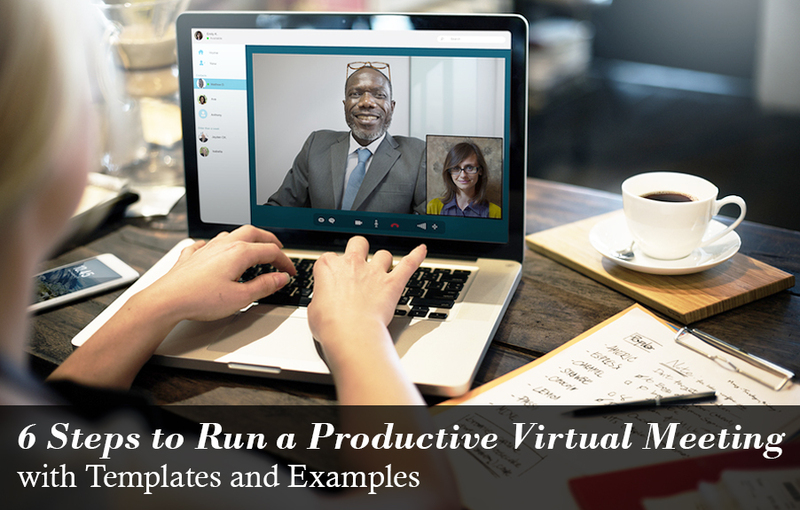 By adopting these tools, I believe you too can make your virtual meetings super productive. Publishing your meeting agenda ahead of time is one of the most important things you can do to help participants prepare for the call. But just as important is making sure the agenda is realistic, time-bound and relevant. Rick sends out a detailed agenda at least 5 business days ahead of time, after gathering topic requests from his team. The agenda document, sent both as an email attachment and included in the meeting request, includes pertinent details that allow everyone to come thoroughly prepared for a productive conversation. Roles are clearly spelled out, along with objectives for each topic, allotted time, and needed preparation. For example, people might be asked to come with questions about a particular topic, status updates or ideas to share. Rick also indicates what form of discussion each topic will take: information-sharing, problem-solving, updates, etc. This way, everyone is ready to dive in at the outset. The Greeter logs in at least 5 minutes in advance, welcoming people as they join, making sure all are connected properly, and perhaps most important, asks questions to stimulate conversation as people wait for the meeting to begin. The Time Manager uses the detailed agenda to keep topics on track, providing typed or audible alerts when it’s almost time to move on. The Action Manager contacts people in advance for a status update, using the action list from the previous meeting, and then tracks the status during the current call, summarizes actions verbally at the end and sends an update to the Rick afterwards. Rick noticed a big impact on how well meetings flowed when he restated two things at the beginning of each meeting: the meeting objectives and the meeting norms. He includes them on a couple of slides before each meeting to make them clear. Each meeting likely has a different objective, so restating the objective at the start gets everyone thinking on the right track. For example, “The purpose of our call is to improve communication across all of the business functions and to better understand how we’re performing”. Rather than read each norm every time, Rick chooses one or two points to emphasize. Even though most people know the drill, by verbally reinforcing these objectives and guidelines, Rick helps ensure that people live by them. When Rick waited for engagement, he never got it. Now he plans for it. As he designs each agenda, Rick builds in several intentional opportunities for interaction throughout the two-hour meetings. For example, he will include a polling question or two via WebEx, sometimes simply to keep things lively and other times because he’s looking for some quick responses on a particular topic. He also prepares questions in advance, some of which go along with specific topics and others of which he keeps handy to prompt a discussion (though these are rarely needed). Topics and related conversations are sequenced to ensure a good pace. Rick frequently pauses to ask particular people to share their unique perspectives as a way to keep conversation flowing and cross-pollinate insightful ideas and best practices. He uses a meeting preparation checklist, to make sure he doesn’t skip any crucial steps. During Rick’s meetings, thorough preparation is the price of admission. Everyone on Rick’s team knows exactly what they need to do several days before each meeting, whether it’s to review a report, prepare a brief presentation, share results, suggest ideas, or ask questions. Not only does he state expectations clearly in the agenda he sends in advance, but Rick also contacts each topic leader directly to make sure s/he understands what’s needed, allotted time and the goal of each conversation. The last thing Rick had to figure out was what to do when people can’t attend a meeting. Read meeting notes, which are richly-detailed, well-formatted, include pertinent visuals, and an action summary at the end. People are also required to notify Rick ahead of time if they cannot attend, so time is not lost waiting for anyone. Either way, it’s the responsibility of the absent person to catch up and be prepared for the next meeting, including reporting on any actions they may have been assigned in absentia. And when it’s easy to get caught up, there’s no excuse. With a bit of self-reflection, the capacity to absorb and apply focused feedback, and the willingness to make changes – even if in baby steps – everyone can learn to transform their virtual meetings from pretty good to super productive. By following above mentioned tips and using tools like R-HUB web conferencing servers, webex, gotomeeting etc. one can conduct quality and effective virtual meetings.